The female suspect wanted for an aggravated robbery which took place on Christmas Eve was taken into custody this evening by the Parker-Hood County Fugitive Apprehension Strike Team. The suspect, identified as Melissa Ann Boyer, 23, of Fort Worth, responded to the advertisement via text messenger, agreeing to meet the victim at a convenience store parking lot in the 12000-block of South FM 730, in Azle, Dec. 24, 2017. Boyer entered the parking lot around 8 p.m., driving a gold four-door passenger car, and met the victim and his brother to look over the hover board. Boyer walked back to her car with the victim following to make the payment exchange for the hover board. When they reached the suspect’s vehicle, the victim reported that Boyer reached into the center console and pulled out handgun, telling the victim to “act like he had the money and to walk away or she would shoot.” Boyer then threatened the victim a second time stating if he followed her, she would shoot him. Boyer and another female inside the vehicle fled the parking lot heading north on FM 730. Boyer was identified early in the investigation, but evaded US Marshals and the F.A.S.T members until today. Sheriff’s investigators credit an anonymous Crime Stoppers tip which led to Boyer’s location. US Marshals and F.A.S.T team members conducted surveillance on the suspect’s location at a residence in Haltom City. Once the suspect arrived, she entered a building adjacent to the residence. Deputies surrounded the building and apprehended Boyer without further incident. Boyer was booked into the Parker County Jail for aggravated robbery. Her bond was set at $100,000. 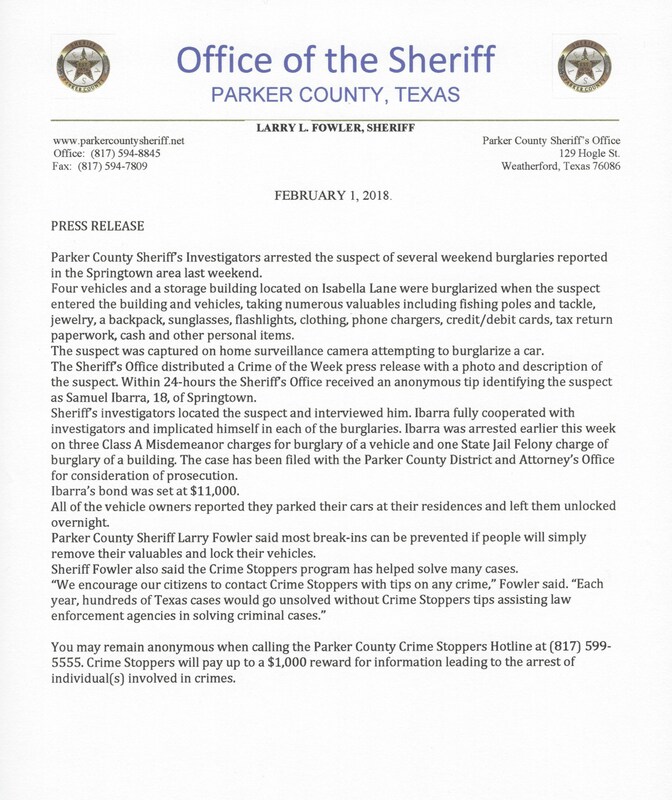 Anyone with information about any crime is encouraged to contact the Parker County Crime Stoppers hotline at (817) 599-5555. You may remain anonymous when calling Crime Stoppers. Crime Stoppers will pay up to $1,000 for information leading to the arrest of suspects involved in crimes. 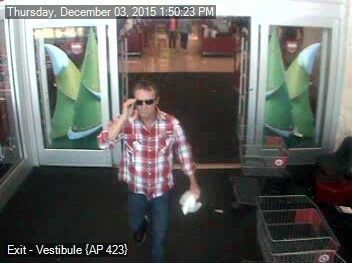 The white male pictured below is an alleged suspect in a theft case. This man is alleged to have entered an employee break room at a local business and stole a wallet from an employee’s purse. Remain anonymous and possibly receive a reward for your information, please contact Parker County Crime Stoppers at 817-599-5555, 1-800-942-STOP, or visit the Parker County Crime Stoppers website at www.parkercountycrimestoppers.com to learn more ways to submit a tip. 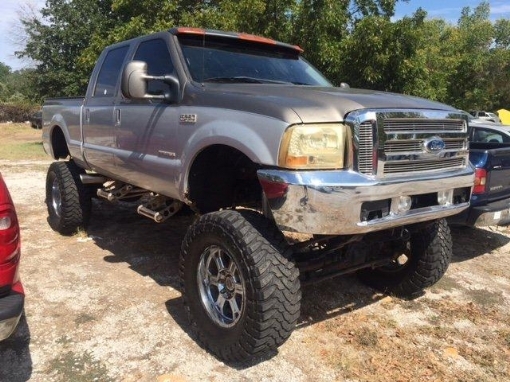 The 2001 Ford F250 pickup pictured below was recently stolen from a local business. The sun visor you see above the windshield was not on the truck when it was stolen. If you have any information as to the whereabouts of this vehicle or the suspects who stole the vehicle, please contact Weatherford Police Department at 817-598-4300. If you would rather remain anonymous and possibly receive a reward for your information, please contact Parker County Crime Stoppers at 817-599-5555, 1-800-942-STOP, or visit the Parker County Crime Stoppers website at www.parkercountycrimestoppers.com to learn more ways to submit a tip. The Weatherford Police Department is asking for your help in identifying the person in the attached photo. The white male pictured is alleged to be a suspect in a criminal mischief case. If you have any information, please contact Weatherford Police Department at 817-598-4300. If you would rather remain anonymous and possibly receive a reward for your information, please contact Parker County Crime Stoppers at 817-599-5555, 1-800-942-STOP, or visit the Parker County Crime Stoppers website at www.parkercountycrimestoppers.com to learn more ways to submit a tip. We need your help in identifying the man in the picture. He is alleged to have stolen a wallet from the victim and then went on a shopping spree to several stores. 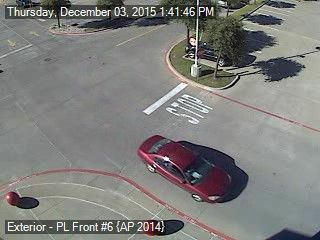 He may have been driving the vehicle pictured – possibly an older model red/maroon colored Ford Taurus. If you have any information, please contact Weatherford Police Department at 817-598-4300. If you would rather remain anonymous and possibly receive a reward for your information, please contact Parker County Crime Stoppers at 817-599-5555, 1-800-942-STOP, or visit the Parker County Crime Stoppers website atwww.parkercountycrimestoppers.com to learn more ways to submit a tip. Weatherford Police Department added 2 new photos. Weatherford Police would like to thank everyone for their assistance yesterday helping us identify a suspect in one of our cases. Due to your community crime fighting efforts yesterday, the victim in our case has now recovered her missing money. As of this afternoon, she has decided not to pursue charges any further, so our investigation is now complete. Great work everyone and thanks again for all your help! "Our citizens are our greatest resource"
Update 07/27/2015 @ 2:40 p.m. – Thank you all for your help! We have identified the suspect and the case is ongoing. The Weatherford Police Department is asking for the public's help in identifying a suspect in a theft case. 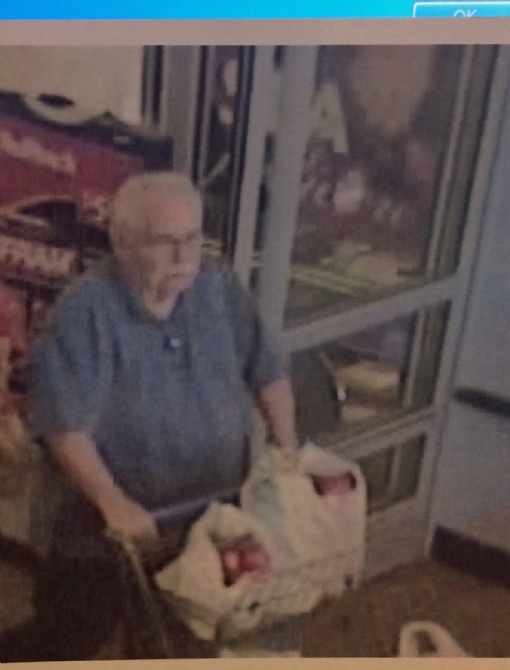 These pictures were taken from surveillance cameras at Weatherford Walmart on 07/18/2015. If you have any information, please contact Weatherford Police Department at 817-598-4300 or if you would rather remain anonymous and possibly receive a reward for your information contact Parker County Crime Stopper's at 817-599-5555 or 1-800-942-STOP.